Gor Mahia’s maverick athletic trainer Sandro Fantoni, arrived at the club this January, accompanying coach Ze Maria. Fantoni, who has been nicknamed “Onyango” by fans is often seen parading up and down the sidelines, gesturing wildy, shouting at match officials. So much so that he once had to be calmed by players as he stormed the field, accusing the referee of biased officiating. The law finally caught up with Fantoni. He has been suspended for one match by the league’s Independent Disciplinary and Complaints Committee (IDCC) who found the Italian guilty of poor conduct in several. The committee has further asked Fantoni to review his temper and reactions, warning that they will respond very harshly if he is involved in another case of misconduct this season. “Mr. Fantoni will serve a further period of exclusion for one match being the immediate next Gor Mahia FC match following this decision. For that match Mr. Fantoni shall not be allowed within any area of the applicable stadium. “Mr. Fantoni is further put on notice to review and temper his actions/reactions and that any reference to this committee for misconduct within this season if proved shall attract stiffer penalties,” the IDCC ruling read. 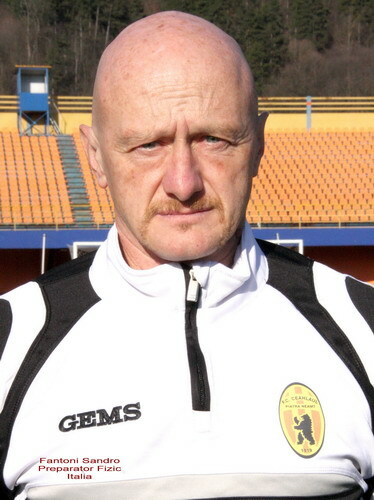 Sandro Fantoni, has been a trainer for several top Italian sides , most recently Salerno Calcio and Salernitana. His most recent position was in Saudi Arabia with Al-Ra’ed . Prior to that he was in Romania, training the players of Ceahlaul, a military side in the top Romanian league.It was here that he worked with Ze Maria. Prior to that, he was in China as an assistant coach of Tianjin, when the head coach was was Beppe Materazzi. That was in 2003. He is a a football nomad, who in Italy has worked with teams like Lazio, Frosinone , Bari, Taranto and Novara. In Salerno – where he won two consecutive championships, series D and Serie C – all remember him with affection and respect, due to his excellent wor. In Italy he is famously known as the Grenade. This Grenade has its pin unhooked and wreaking havoc each which way. He is a bad advertisement of the Gor Mahia brand and needs to be reined in by our coach who has become known for not tolerating indiscipline. If Fantoni’s Italian countrymen know him as “Grenade”, then this explosive demeanor that we have witnessed from him must be deeply rooted. I consider the one match ban that he was handed to be a slap in the wrist. We’re I to be asked, I would have bargained with IDCC to hand him a six matches ban in exchange for the 3 points that we were docked unfairly. That’s too academic. If that were the case we would send grenade in a scuffle so that we are not penalised. Should have been deported Koffi Olomide style for disrespecting Africa! Admin. there are no top sides there. The only recognizable names are Lazio, Bari and Frosinone. GOR MAHIA LOTTO IS THE PANACEA TO BRINGING FANS BACK TO THE STADIUM AND ELIMINATING THE FAKE MERCHANDIZE PROBLEM- I HAD TOUCHED ON THIS BEFORE. From the onset let me say that I agree with admin that the prices of tickets should be reduced to 100 for terraces and 250-300 for VIP. Simple logic, look at the volumes betting companies have achieved by pricing their products at 50 and 100 instead of say 200 and above. Gor Mahia Lotto cannot compete with the likes of Sportpesa ( infact maybe SP will not allow it to start as its success will eat into their market share) so the only way to make it viable is to customize it. Let all purchases of GENUINE GM products tickets, merchandise, membership earn the buyer an entry or entries into the GM Lotto with the following prizes. + 45 consolation prizes of kshs.1,000 total =kshs.45,000. Thus for each home match GM Lotto will put up kshs.100,000 availabe for 49 winners. Having many winner is key to making the Lotto attractive. , then GMFC will raise kshs. 1,725,000 from an outlay of kshs.100,000. MORE IMPORTANTLY NO FAN WILL WANT TO THROW AWAY A CHANCE OF WINNING BY BUYING A FAKE TICKET. ENTRY INTO THE LOTTERY SHOULD BE THROUGH SMSING THE TICKET NUMBER TO GM LOTTO AND A POSITIVE REPLY CONFIRMS ITS AUTHENCITY ( COMMON SENSE DICTATES THAT FANS WILL ONLY BUY TICKETS FROM AUTHORIZED OUTLETS AND ERRANT EC MEMEMBERS/CARTELS FAKE TICKET’S WILL BE RENDERED WORTHLESS TO SOME EXTENT. WINNERS SHOULD BE NOTIFIED BY PHONE MESSAGES/ SMS BEFORE THE MATCH ENDS. ENTRIES SHOULD BE CLOSED 15MINS TO THE START OF THE MATCH TO ENCOURAGE FANS TO AVOID LAST MINUTE RUSHES. LATE ENTRIES SHOULD QULAIFY FOR THE NEXT HOME GAME. THE IMPROVED ATTENDANCE WILL BOOST THE MORALE OF OUR PLAYERS NOT TO MENTION THE FINANCIAL STABILITY ACCRUE TO THE CLUB THROUGH IMPROVED GATE COLLECTIONS. THE SAME APPLIES FOR MEMBERSHIP. KSHS. 500 TO 1500. THIS SHOULD MAINTAIN A DIFFERENT REWARD LINE WHOSE PRIZES SHOULD BE HALF YEARLY. MAKE THE MEMBERSHIP AFFORDABLE AND UNIFORM SO THAT WE DON’T HAVE PEOPLE CLAIMING THEY ARE MORE “GOR DAMU” THEN OTHERS. THOSE PHILANTROPIC ENOUGH SHOULD HOWEVER BE ENCOURGED TO THEIR MAKE DONATIONS AND BE AWARDED MEDALS OF RECOGNITION. AGAIN REMEMBER WE ARE INTERESTED IN CONSISTENT VOLUMES NOT ONE OFF CONTRIBUTIONS. Consolation prizes 60 consolation prizes of kshs.2,500. Total kshs.150,000. These consoluion prices are the key to marketing as the GMFC will be cast wider. More people will say to the other “look I won”. The idea is to encourage uptake of membership. Ramogi FM, KBC , Radio Jambo can be roped in to advertise. Now this is pure speclation but how many members can we get from Nyanza, Nairobi, Mombasa, Nakuru and the rest. Forget the 2million or 1 million numbers bandied around. If we manage even 30,000 per (remember the 63 prizes worth kshs.1,000,000 up for grabs twice per year) the GMFC can raise kshs.30,M from membership from investing 1M assuming the membershio fee is kshs.1,000. The same Lotto principle should apply for purchase of genuine merchandize with a separate prize line being maintained for the merchandize lottery. This can be conducted monthly. Of course the prizes should be lower maybe between 5000-1000 range due to the unpredictable nature of sales. Jakom and EC talked of a budget of kshs.100 to make an impact regionally and continentally. Now Sportpesa is giving us kshs .65M per year + the above 52M we will have kshs117,375,000. MOST IMPORTANTLY WE WILL HAVE DEALT A HUGE BLOW TO THE FAKE CARTELS BY MAKING THEIR PRODUCTS LESS APPEALING. WITH THE ABOVE WE CAN PAY OUR 25 PLAYERS AT LEAST KSHS. 150,000/MONTH X 25 WHICH COMES TO KSHS.45M PER YEAR. REMEBER ALL SOURCES OF INCOME HAVE NOT BEEN EXHUASTED E.G 2ND SPONSORSHIP, THE SPL GRANTS ETC. Ever hear of the Arab / Spring uprising. It’s time for K’Ogalo uprising. We have e-mails, SMSes so let people share ideas prior to the SGM and agree on the top most issues i.e mission and goals otherwise the wily Jakom will take advantage of this meeting to drive his agenda. We can start with a ten point plan here at Bloggers Branch. Forgive me, but to me let’s put priority in conquering the football regionally and continentally as we strive to build the GMFC stadium. FOOTBALL IS ABOUT WINNING TROPHIES. For Fantoni or Grenade, one can choose which side of the coin they want to see. Grenade in its nature is destructive and there is no negotiation to that. Probably we challenge ourselves to the question of its objective. Supposing it is used to annihilate the enemy then one would want to cover as much ground as possible and of course this is used within the confines of those who have the backing of the Law. If the same is used illegally and with those who are outside the confines then that is simply wrong. Supposing that Fantoni notices that things are not done some times on the pitch and any soccer lover in this country notices that this happens frequently, would I be right or wrong in saying that he then explodes for the right reasons except that he is too close to the seen and just does not hide. Is there a possibility that this scenario is a ground for us to understand how people react to different situations at different times hence sociology. Closer home, the Nilotes in Kenya are always accused of being arrogant, while within themselves they know it is just a way of expressing self with confidence, could it just be a mistaken opinion… I am just thinking. Brilliant analogy @Jaupanda only problem is what is likely to happen if all the passionate Gor Mahia fans exploded like Fantoni the Hooligan? And his reasons for exploding are not always right as you allude to in your eloquent analogy, like the insults he rained on Matasi vs Posta Rangers. Matasi had not done anything wrong in my eye. He did not even waste time as is the norm with KPL teams angling for a draw. Matasi’s only crime according to the Hooligan was that we had failed to score, did not seem likely to score and time was running out!!! Adnm.We napotesa maniko yangu yote kwa sababu? Wacha mi aone kama hi tapita. Kumbe ni fundi ya matambo ndio napotesanga mandiko yangu. Sasa mimi iko sambamba. Bado nangoja ball. Huyo Fotino sijajuwa sana. Tena sai mimi kuangalia iyo mandiko yote ju yake tasumbua kichwa yangu. Othrwsr hope all kogaloo boyis are ok. Look yuo letar. Football is a game of hooligans be it from the TB or from the fans. Even if some people embark on a mission to write a whole dictionary on hooliganism in gor mahia, it is an exercise in futility. Hata Loga alirusha Laptop chini just in the name of football. Fans in Kenya who have not even met any Arsenal players have committed suicide in the past. Gor Mahia might play Real Madrid;these former Gor players are on road to conquer Africa and play in club world cup;Akumu Agay and Odhiambo.Tuwache kudanganywa hapa we can march Zescos purse and buy the best and take this club to familiar territories. @oduor12…I like your article.very nice piece.if only it can be implimented with a few added values and omissions here and there and we will be good to go!! Exactly the more titles Mighty K’Ogalo wins apart from nationally but also regionally and continentally the more the brand will be marketed and you will expand the fan base in the countries mentioned. What’s the point of investing so much resources in a stadium that attracts only the likes of city stars instead of directing those resources towards the players/TB so that we can match & defeat the likes of Azam, Simba, APR, SC Villa, El Mereik, Esperance, Zamaleck at Nyayo/ Kasarani and lift CECAFA and continental titles. COMRADES PRESENT A WRITTEN PETITION OF MEMBERS EXPECTATIONS ON WHAT WE EXPECT OF THE EC OTHERWISE IT WILL BE THE USUAL “LOFTY BUT EMPTY” PROMISES OF BUILDING A STADIUM THAT AR HAS RECYCLED FOR THE LAST 3 ELECTIONS. This Tusker Muho game very suspect. A ball boy throws a ball to the pitch when Muho is attacking while Farouk could not dive to prevent those two goals.Gor would have to win all games and do the job themselves; that is beat Tusker on the final day.